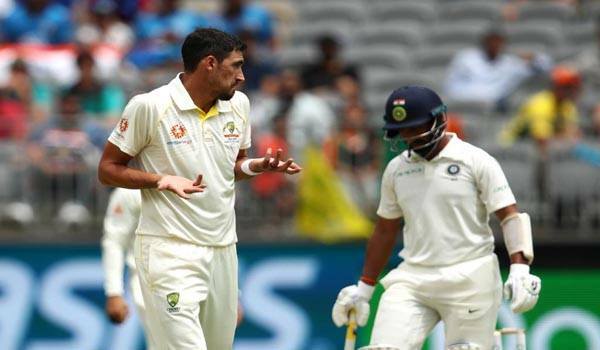 Melbourne: Riding on debutant Mayank Agarwal's 76 and Cheteshwar Pujara's unbeaten 68 runs innings, India scored 215 runs for the loss of two wickets in 89 overs on the opening day of the third Test of four-match series here at MCG on Wednesday. At the time of stumps, Virat Kohli (47) and Pujara were at the crease. So far, they added 92 runs for the third wicket partnership.Earlier, Virat Kohli won the toss and decided to bat first. Agarwal and Hanuman Vihari scored 40 runs for the opening wicket partnership. For Australia, Pat Cummins was the only successful bowler as he bagged all two wickets in Indian innings. Cummins dismissed Vihari for eight runs in the 19th over. Then, Pujara and Agarwal stitched together a crucial 83 runs partnership for the second wicket, helping India to get past 100 runs mark.Agarwal, who scored first fifty as an opener for the visiting team in the Test series, was caught by Tim Paine off Pat Cummins for well made 76 off 161 balls. Indian lost Agarwal in the form of the second wicket just before the Tea break. Captain Virat Kohli replaced the right-hander Agarwal and took Indian tally to 215 runs. India might have scored runs at 2.42 runs per over, but they managed to keep the Aussies bowlers at bay.